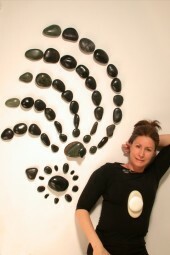 Stone Therapy is an ancient healing art recently rediscovered. Its modern form came in 1994 when massage therapist form Tucson, AZ brought it back to life. Stone Therapy is a type of thermotherapy, using deep penetrating heat from smooth basalt rocks and alternating cold from marble stones. Two types of stones are applied in Stone Therapy. Basalt is igneous rock (lava), which holds and transfers heat to aching muscles. Cool marble stones, a sedimentary rock, penetrate the body, driving healing energy to the affected areas.
. Balances and revives Chakra systems, and so much more.